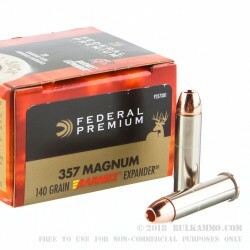 This 357 Mag cartridge by Federal Premium features a 140 grain Barnes Expander hollow point projectile. 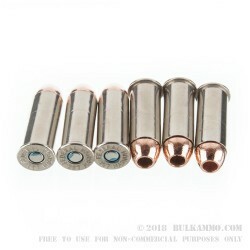 The bullet has a solid copper design which entirely does away with the separation of core and jacket, so you are assured 100 percent weight retention upon impact. This bullet’s ability to expand dramatically within targets gives it tremendous stopping power, making it optimal for self-defense. 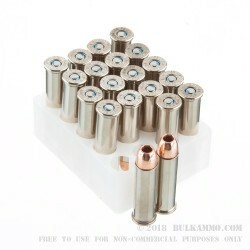 Load this round into a lever action rifle and enjoy boar hunting in areas where toxic ammunition is banned as well! This round’s devastating terminal performance is made all the more potent by its very fast 1,400 fps muzzle velocity. It delivers exceptional accuracy as well. This round’s Boxer primed reloadable brass casing is plated in nickel, so it will feed and eject reliably in all manners of firearms. Invest in these 20 cartridges and why the team up between Federal and Barnes spells out serious firepower.